Lately, I've been wanting to paint tropical landscapes, seascapes and flowers such as this hibiscus. It must be that I've had enough of winter snow, ice and frigid temperatures! 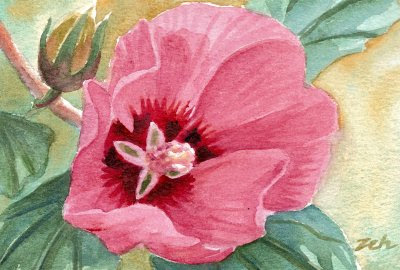 Whatever the case, this delightful hibiscus was a joy to paint. The sun is sparkling in this painting! Might I add...the NICE WARM summer sun.